From the moment you walk in our doors we want you to feel relaxed and welcome. You may choose to wait in the patient lounge and enjoy refreshments at the coffee bar. While you enjoy your wait, you will have access to screens that will provide education on the services we offer. Children can play freely in the indoor play area as you watch through a glass wall and enjoy the peace and quiet. We want even our youngest patients to enjoy their visit at Northern Dental Design. 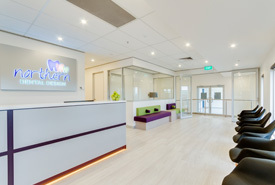 It is our desire that all your experiences at Northern Dental Design are positive. On your first visit you will fill out a medical/dental history form. Please bring any insurance information you may have. Our team will take the time to get to know you and listen to what your goals are for your smile. We will perform a complementary comprehensive oral evaluation and oral cancer screening. Any necessary x-rays will be taken to ensure a thorough examination. Please allow an hour for your first visit. If the treatment needed is not extensive then you may also get your teeth cleaned at the same time. Upon completion of the examination, we’ll discuss with you what your treatment options are. All plans are fully customised to meet your individual needs. Call today and let us personalise a plan just for you.